The Jīn Guì Yào Lǜe ("Essential Prescriptions of the Golden Coffer"), like its sister volume the Shāng Hán Lùn ("On Cold Damage"), is a gem reconstituted from fragments of a lost text called the Shāng Hán Zá Bìng Lùn ("On Cold Damage and Miscellaneous Diseases") by indisputably the most brilliant medical mind that China ever produced, the Hàn Dynasty physician Zhāng Jī. Exerting an influence on the development of Chinese medicine unmatched by any other medical scholar, Zhāng integrated the then relatively new theories of systematic correspondence of the Nèi and Nànjīng with an already vast practical knowledge in the use of medicinals. Such was his brilliance that it was not fully recognized by Chinese physicians until centuries later in the Sòng Dynasty, when Zhāng's combination of theory and practice became the mainstream in Chinese medicine that survived centuries of scrutiny from successive generations of medical scholars and buttressed traditional medicine against the challenge of Western in the twentieth century. Combining theoretic etiologies with detailed diagnosis and skilfully devised treatments, Zhāng’s work has left an indelible print on traditional medicine in China for nearly 2,000 years. A third of the most commonly used formulas in Chinese medical practice today were devised by Zhāng Jī. 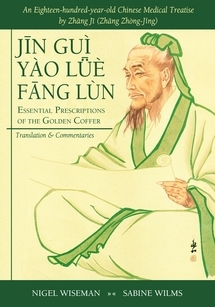 The Jīn Guì Yào Lǜe ("Essential Prescriptions of the Golden Coffer") covers diseases other than external contractions dealt with in the Shāng Hán Lùn, including lung diseases, water swelling, dissipation-thirst, impediment (bì), summerheat stroke, mounting diseases, and gynaecological diseases, to name just a few. The first chapter and explains the etiology of disease and treatment principles, while the last discusses food prohibitions.